Company: Thorichthys meeki (Firemouth Cichlid) are suitable for community aquariums with other South and Central American cichlids. 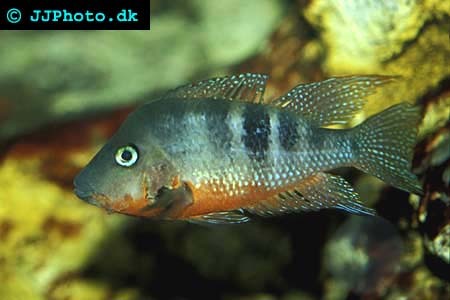 Aquarium setup: Thorichthys meeki (Firemouth Cichlid) should be kept in a planted aquarium with hiding places among rocks and bogwood. Place large rocks around the plants to prevent the fish to dig them up. Be sure to provide flat rocks that can be used as breeding substrate. 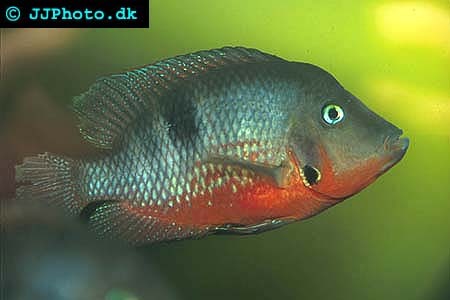 This is a suitable cichlid for beginners. Feeding: They will accept flake food and pellets. Breeding: This species is easy to breed. They are substrate breeders that lay their egg and fry on an in advanced cleaned flat surface, usually a rock. The females guards the eggs while the male kepp other fishes out of their breeding territory. The fry can be feed newly hatched Brine Shrimp.